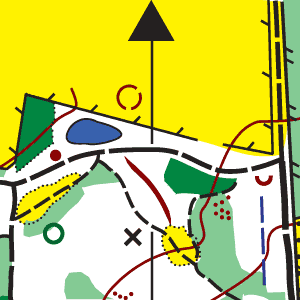 Details of the areas HAVOC has mapped for orienteering. Below the table there are directions for driving to some of the areas. A link to Streetmap is included for all the areas. Leave the main road at the M25/A12 roundabout (M25 junction 28). Follow the road signs towards Brentwood (A1023), then follow the brown signs to Thorndon Park North i.e. drive straight on through the first set of traffic lights. Turn right at the second set of traffic lights into Mascalls Lane. Drive for one mile along Mascalls Lane. Drive straight on through the next set of traffic lights into Eagle Way. After half a mile the entrance gates and lodge to Thorndon Park North are on the right. Follow the country park access road to the Visitor Centre car park. Facilities: toilets, shop (Essex Wildlife Trust), refreshments, books, gifts etc. Nice walks, nature trails and cycle routes. Dogs welcome if under control (NB 'poop scoop' compulsory). Car parking charge - tiered structure: £1 for 30mins to £5 for over 3 hours. Nearest public transport is Brentwood railway station approx 1 mile north of the event. One mile from M25/A12 junction. The 'cricket field' car park is off Weald Road, just east of South Weald village. Toilet facilities, dogs welcome if under control (NB 'poop scoop' compulsory). Approach from M25 or A12. Leave main road at M25/A12 junction and follow road signs towards Brentwood. After half a mile turn left at the traffic lights towards Weald Country Park. From there follow Orienteering signs to the car park. Nearest public transport is Brentwood railway station approx 1.5 miles SE of the event. Car parking charge - tiered structure: £1 for 30 mins to £4 for over 3 hours. Epping Forest South West, Chingford Plain car park, near Chingford. Grid reference TQ 394 949. From M25 junction 26: Follow the A121 east to the City Limits (Wake Arms) roundabout, take the 4th exit (A104) and continue about 2 miles to the Robin Hood roundabout; cross this roundabout and after 1 mile turn right into Rangers Road (A1069). After 1 mile turn right into Bury Road and then right again into Chingford Plain car park. From A406 North Circular: Follow the A104 north through Woodford Green; after 3 miles turn left into Rangers Road (A1069), then proceed as above. From M25 Junction 29: Head east 6 miles to A127/B148 junction, then head south 1 mile along the B148 (West Mayne), then turn right at the roundabout onto the B1036. Head south, then east 2 miles along the B1036 (Mandeville Way), then turn onto the B1007 (Staneway) and head south west for 1 mile. Turn left into Dry Street and then right into the Beacon car park field. From M25 junction 30: Head east 5 miles to A13/B1007 junction, then head north for 4 miles along the B1007. Turn right into Dry Street and then turn right into the Beacon car park field. Nearest public transport: Laindon railway station approx 1 mile north of the event. The main car park is in the centre of the park. Entrance off Broxhill Road, Havering-atte-Bower. Toilet facilities, dogs welcome if under control. From Gallows Corner (A12/A127) junction: Turn north at roundabout along Straight Road and Broxhill Road towards Havering-atte-Bower village. From the north: Approach along B175 towards Havering-atte-Bower. Signposted from village green. From M25 Junction 26 take the A121 East to the Wake Arms roundabout, then the A104 South to the Robin Hood roundabout, then turn right towards High Beach and then left at the tea hut and drive about 500 metres to Fairmead Bottom car park. From the A406 North Circular take the A104 north towards Epping Forest; at the Robin Hood roundabout turn left towards High Beach and follow above instructions. From M25 Junction 29: Head east 6 miles to A127/B148 junction, then head south 1 mile along the B148 (West Mayne), then turn right at the roundabout onto the B1036. Head south then east 2 miles along the B1036 (Mandeville Way), then turn right onto the B1007 (Staneway) and head south west for one mile. Turn left into Dry Street. After a mile turn right into One Tree Hill, the car park is ¾ mile on the right at the bottom of One Tree Hill. From M25 Junction 30: Head east 5 miles to A13/B1007 junction, then head north 4 miles along the B1007. Turn right into Dry Street. After 1 mile turn right into One Tree, the car park is ¾ mile on the right at the bottom of One Tree Hill. The car park used is in the King George's Playing Fields about ½ mile from Brentwood town centre off the A128 Ingrave Road. NB No dogs allowed in the playing fields area. Car park charge during high season.